Create a quick and easy way to document the tactics, with all the necessary components that go into a people-centric omni-channel marketing campaign. Ensure every marketing tactic focuses on delivering business benefits, as well as benefits to the people in our audiences. Create a framework that allows us to prioritise, plan and track progress with Agile style methodologies. Loosely follow the SMART marketing objective setting methodology. Enter, “People-based marketing tactics”. Internally we affectionately call them “Recipes”, with all the ingredients needed to cook up a successful campaign! Before writing any marketing tactics, it’s important to get to know your customers and customer segments. For this we let our Data Analysts loose on all the customer data silos available to stitch and segment the data. What are the biggest bottlenecks in the marketing funnel? What are the key high value segments that we should look at as a priority? How does seasonality play a role, and therefore steer our tactics? What does a high value lead look like? So that they_______, (clear benefit to the customer to ensure a value exchange). This example tactic targets a specific set of people with a similar mindset, spanning multiple channels. So that they can find the perfect gift for their friends and family. This tactic is an example of how we can use this methodology to plan “next best action” tactics based on where people are in their lifecycle. So that they can look good and stay warm this winter. People-based marketing can extend beyond just our known customers. Through social engagement audiences or pixel audiences, we can deliver relevant ads to unknown people as well. So that they can experience the new model. Once you get into the swing of writing marketing tactics using this methodology you can quickly design tens or hundreds of ideas. You only have so much time in the day, so it’s important to prioritise and track which tactics you are deploying. To do this, we use Kanban Boards like Trello or AirTable’s Kanban feature. Planning in this way gives visibility to everyone in the team, agency or client on what is being played, when. For the sugar on top, we create a Slack channel that is pinged every time a new tactic is moved to “Live”, which acts as a simple log of activity. Measuring People-based marketing tactics is easy because we focus in on a specific audience, with a specific next best action. We’re not trying to answer questions like “Do YouTube ads make me money”. Instead we can ask “Does targeting this YouTube ad at this segment increase the likelihood that they will buy again”. To answer this question, we can use lift tests. Divide an audience segment into control and test buckets. For example, we could take everyone who has signed up for a Test Drive, divide them into 2 buckets, and measure the impact through to purchase. People who have signed up for a Test Drive and just received email. People who have signed up for a Test Drive and receive email and YouTube ad. People who have signed up for a Test Drive and just receive YouTube ads. With something like Trello or AirTable we can record the results with each card as we go. This gives us a nice record of what works and what doesn’t alongside general reporting. 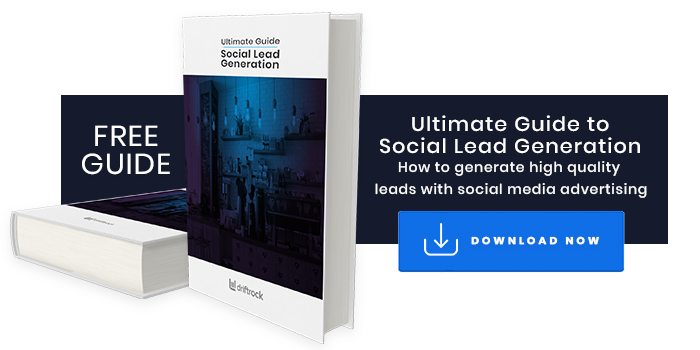 Check out our free guide for some inspiration on top tips on running successful social media lead generation campaigns. Have a go and let us know that you think!